Not very useful, but a fun bit of target practice on the cheap. ToysRUs, at least in the United States, is on its last legs thanks to bankruptcy and liquidation. 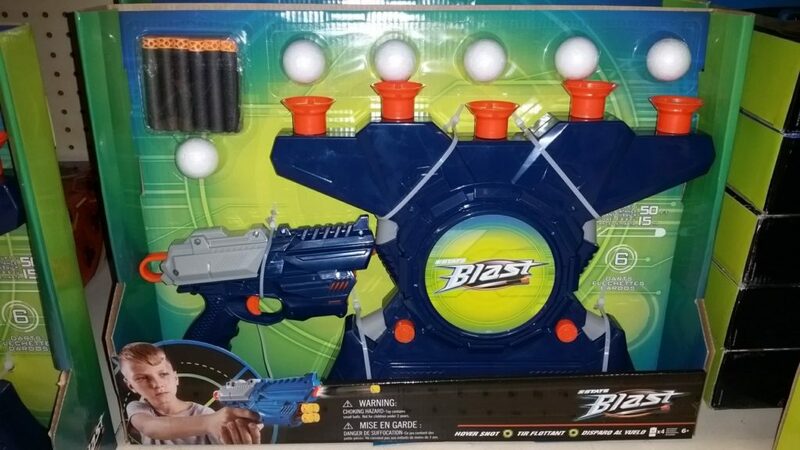 However, TRU has several in-house brands that had products in the distribution pipeline, including the Stats Blast blaster line. The first of these products is on shelves, assuming your store hasn’t been cleared out yet. It’s a simple target game with a small pistol, based on this original version. It may not be worth the original $20 asking price, but for a discount you might like it. Wait, Are Those Waffle Darts? Yes, yes they are. For some reason, TRU decided not to use Prime Time Toys or Zuru for this new product. As a result, we have a blaster made in China that isn’t going to use a proprietary dart. On the plus side, it does shoot straighter as a result. Even if the one I bought is only hitting 53fps on average. I’ll get to the balls in a minute. Have some patience! The pistol itself is simple in operation. Amusingly, pictures on the box instruct the user to prime the pistol by pulling on the hoop (which is the rear of the plunger itself), NOT via the perfectly functional slide. 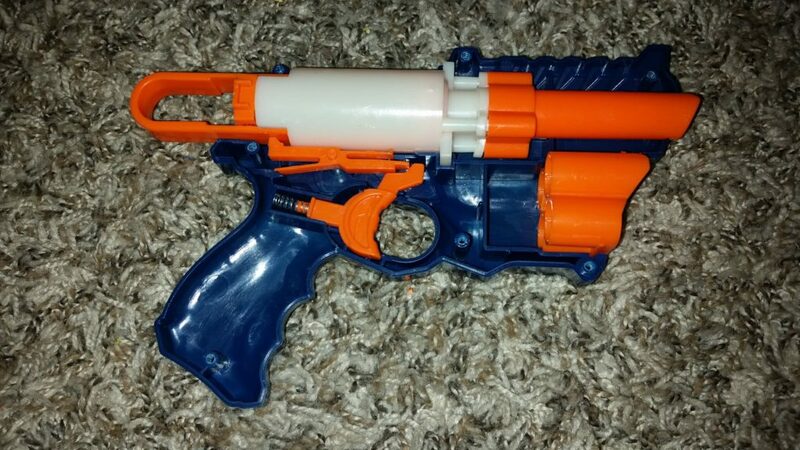 The blaster holds one dart in the barrel, and has storage for four more shots. The molded plastic “sear” acts as its own spring, somewhat like a Jolt. A few screws hold the barrel to the plunger tube, with the safety valve sealed in between. 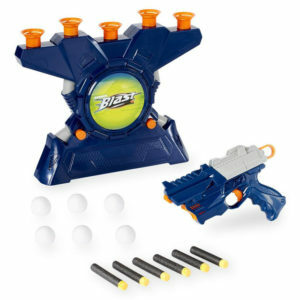 The blaster itself is rather small, and clearly is designed with just kids in mind – the molded ridges are narrow enough to be uncomfortable. The more important part of the package, for most people, is probably the target. A small fan runs off of 4 “C” alkaline batteries, blowing air up through five outlets. Several Styrofoam balls come with the package, and are light enough to be suspended in midair by the fan. It should be noted that the target unit has some noticeable vibration to go along with the fan. In short term use, it doesn’t affect anything. However, if left going for several minutes, it is possible for the unit to creep along the table, barring some kind of temporary adhesive or object to block it. I don’t recommend setting it up near the edge of your table. Out of interest, I tried floating several other ball-shaped objects, including Rival rounds. All of the were too heavy. If for some reason you lose the target balls, you may have to search your local craft store for small new Styrofoam balls as replacements. Finally, there is a question of usefulness. Even with large balls, you’re unlikely to hit them at distance. 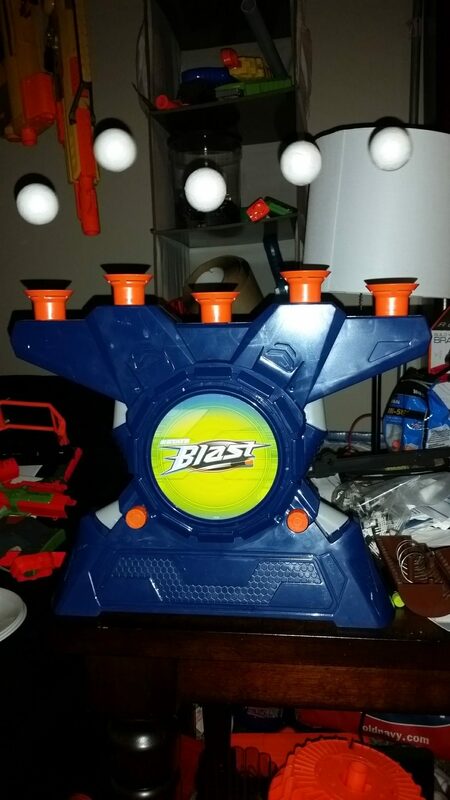 In fact, depending on your blaster’s level of power, you’re more likely to strike the top of the target and tip it just enough to make all the balls fall over due to the sudden change in airflow. That’s a…win, I guess? 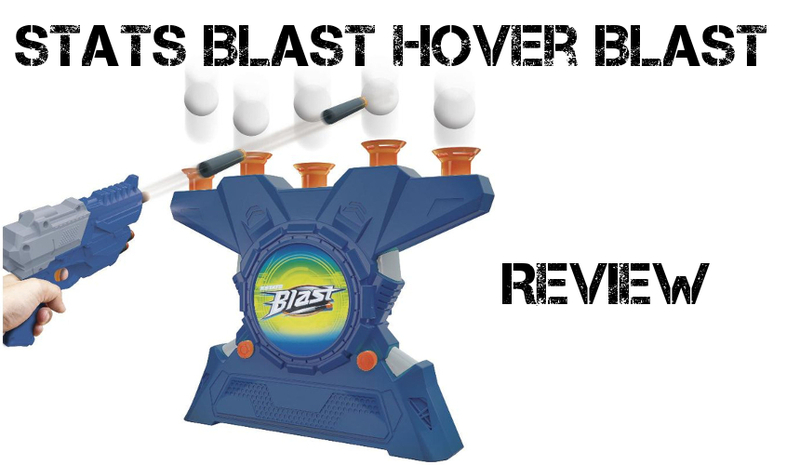 The Stats Blast Hover Shot isn’t really with $20, in my opinion. It does work, but there are far better pistols to be had for less, and the small balls are a poor target for most blasters, compared with something like a target board. If you do want it, however, the price is down or as long as ToysRus is still open. This entry was posted in Accessories, Dart Blasters, Reviews and tagged 2018, blaster, blaster hub, hover shot, review, stats blast, target on May 19, 2018 by BuffdaddyNerf.